Rising up behind our hotel in Weggis was the impressive Mount Rigi – an iconic image of the skyline of the Lucerne area and renowned as the Queen Of The Mountains. The Rigi area has been a tourist paradise for many years now and really took off as a travel destination in Victorian times when the Victorian concepts of health and beauty led the well heeled to search for places in which they could relax and nurture their souls! Queen Victoria herself was carried up the mountain in a sedan chair in 1868 (spare a thought for the porters!) so she could spend the night at the hotel at Rigi Kulm and awake to a glorious sunrise. She would not however have seen the TV tower perched on the top of the mountain as this was obviously not constructed until much later – by Swisscom in 1958 to be precise! Indeed the Romantic poets and painters of the nineteenth century were quite obsessed with the beauty of this area and it provided inspiration for many of their works. As early as 1814 the poet Shelley, who was a great admirer of the Alps, visited the area with his companion, Mary Godwin, who wrote of their stay in the Lucerne area, “this lovely lake, these sublime mountains and wild forests, seemed a fit cradle for a mind aspiring to high adventure and heroic deeds”. I also discovered that the famous British painter JMW Turner was fascinated by the Rigi landscape and painted it no less than 30 times. The wonderful lighting effects that he observed created inspiration for some beautiful works of art, Blue Rigi, Red Rigi and Dark Rigi amongst others. The Blue Rigi : Sunrise (1841/2) has pride of place in an exhibition currently being held at the Tate Gallery entitled, Tate Britain, “Late Turner:Painting Set Free” . This retrospective is a collection of Turner’s work from 1835 when he turned 60 up to 1850, the year in which his final work was exhibited. Now I am certainly neither a painter or a poet but I do love to take photos so, as I’ve been lucky enough to make the ascent to the top of Rigi Kulm several times, I have now amassed quite a collection. All were taken at the same time of year in April and the differences in weather, temperature and conditions are very interesting. On our recent trip this year we were hardly able to see anything. As soon as we reached the summit a sudden fog descended and the temperature plummeted a good 10 to 15 degrees in a matter of seconds. The view once the fog had descended! We were a long way from home but not quite as far as Sydney which is on the other side of the Australian continent to our home in Perth! I should also add that although it is possible to walk up and down the mountain (or ski in the colder months) Monsieur Le Chic and I took the cogwheel railway up to the summit at Rigi Kulm. There are in fact a number of options available. Accessibility was greatly increased by the opening of the first cogwheel railway in Europe in 1871, which went from Vitznau on Lake Lucerne up to the summit station at Rigi Kulm (1798 metres above sea level). The little red train is still operating – no need to take a sedan chair up to the top anymore! On the Lake Lucerne side you can also take the cable car from Weggis to Rigi Kaltbad and then connect with the railway for the last section up to the summit. Coming from the other side of the mountain in the direction of Lakes Zug and Lauerz, you can take the blue cogwheel railway from Arth-Goldau all the way up to the top. All of these travel options are free with the Swiss Pass otherwise a return ticket costs 68 Euros full price and 34 Euros half price (concessions are available). Vitznau Station on Lake Lucerne – the ferries go back to Lucerne from the adjacent quay or further down the lake in the direction of Fluelen. Checking the weather forecast but sometimes going ahead with the planned trip anyway can pay dividends. Last year we just about had the place to ourselves as the damp misty weather at lakeside level had put most tourists off from making the Rigi ascent. On this occasion we could enjoy the 360 degree panorama at the top where views stretch out towards the Alps proper (technically Rigi is part of the Swiss Plateau not the Alps). We could gaze across to the Saint Gotthard Massif and the Eiger and Jungfrau many miles away. However due to the heavy clouds at lower lying levels, it looked as though we were floating about on a sea of cotton wool. There were only a handful of tourists at Rigi Kulm that day. A lovely couple from Tel Aviv took our photo! The previous year was quite spectacular! It had been a very cold winter and there was still heavy snow at the summit. You could see exactly why this is a paradise for winter sport lovers with skiing, sledging and Nordic cross country skiing all very popular. In the summer the hikers come out to enjoy the wonderful panoramic views and the benefits of walking in the clear mountain air. The light was brilliant and dazzling! 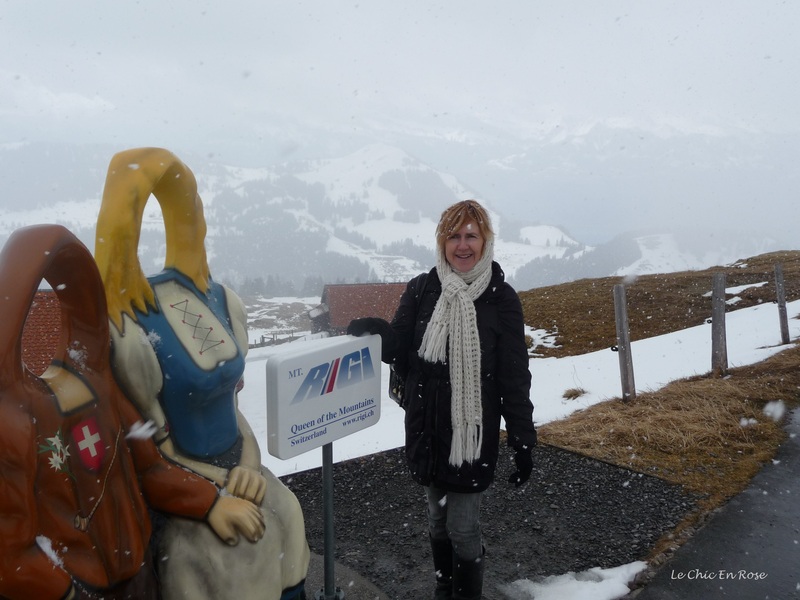 You never know what to expect up at the top of Rigi which adds to its fascination! There are plenty of facilities at the top too – the Rigi Kulm Hotel has an excellent cafe style restaurant and there is a well stocked souvenir shop and kiosk too just in case it’s warm enough for a quick ice cream whilst waiting for the train back down the mountain! We have never stayed overnight at the hotel so haven’t experienced a “Red Rigi” sunset or sunrise though we have certainly seen Dark Rigi and Blue Rigi if you are referring to the azure colour of the skies on a clear day. However on the cable car descent we did down into the pretty little town of Weggis, we saw the beautiful light that must have inspired Turner to paint Blue Rigi. It is somewhere between a soft hazy blue, lilac and grey and the effect over the shimmering waters of Lake Lucerne against the backdrop of the mountains is truly magical. The view from the cable car is stunning! 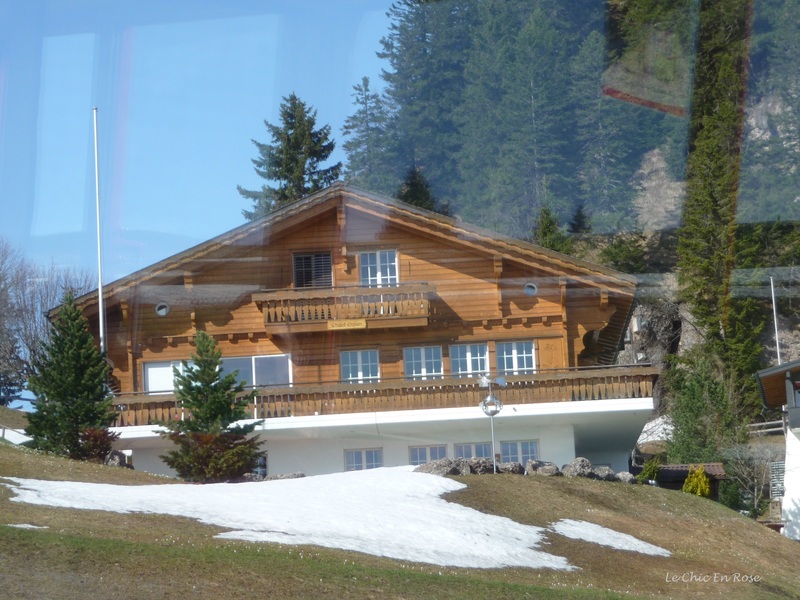 On one of our descents I spotted my Traumhaus (Dream House). However Monsieur Le Chic feels it would be too impractical to live there not to mention considerably out of our price range! I can dream on! It certainly looks like a lovely place – but I would prefer the blue skies! Hello Rosemary lovely to see you here! It certainly is a lovely place especially when the sun shines and the sky is cloudless – the weather can change rather suddenly as you can see! Amazing photographs Rosemary – it is simply stunning – not surprising Turner was so taken with it. I love that house too!! Those mountains in the mists shots are glorious, Rosemay! Not that I’m really envious- I prefer to look from a warm vantage point 🙂 My eyes can see its beauty but my body doesn’t have to suffer the temperature. I love the little cog railways too. I’d rather like to try that train ascent! It’s well worth doing Andrew – great scenery and views (most of the time)! Thank you for the continuation of the Weggis story. It’s great fun to get to “travel” along with you in your story. Your dream house does look idyllic! Can you imagine? Well, it’s fun to imagine… Hope you have a great weekend!